Genel benlik saygısı kişinin kendi değeri ile ilgili algıdır. Bu zihni yapı, öğrencilerin akademik başarılarıyla ilgili kendi imajlarını etkilediğinden eğitim bilimlerinde gayet önemlidir. Bilişüstü stratejiler genellikle bilişsel psikolojide incelenirler. Öğrenme sürecini kolaylaştırırlar ve daha pozitif İngilizce öğrenme çıktıları alınmasını sağlarlar. Bu yüzden, çalışmamız İngilizcenin yabancı dil olarak öğreniminde detaylı modeller sağlamakta ve bu değişkenler arasındaki ilişkiyi incelemektedir. Çalışma Türkiye›de 2016 yılında Ege bölgesinde bir Devlet üniversitesi ve bir kolejin son sınıf öğrencileri olmak üzere toplamda 201 öğrenci üzerinde gerçekleştirilmiştir. Kolej öğrencilerinin son sınıfının çalışmaya dahil edilme sebebi İngilizce seviyelerinin üniversite öğrencilerininkine yakın olmalarıdır. Çalışma korelasyon analizi kullanmıştır. Sonuçlar genel benlik saygısı, bilişüstü beceriler ve İngilizce öğrenme çıktılarını etkileyebilecek diğer bazı faktörler arasında pozitif korelasyon göstermiştir.Öğrencilerin genel benlik saygılarının, bilişüstü stratejileri kullanımlarıyla önemli derecede pozitif korelasyona sahip oldukları ve yine aynı şekilde genel benlik saygısının akranlarıyla işbirlikli öğrenme, anadili İngilizce olanlarla iletişim ve İngilizce televizyon kanalları seyretmeyle ve İngilizce müzik dinlemeyle pozitif korelasyon içinde oldukları görülmüştür.Öğrenme aktiviteleri esnasındaki kendi kendini motive etme kapasitesinin öğretmenin eğitici yetenekleriyle negatif korelasyon göstermesine karşın öğrenme hedeflerini gerçekleştirmenin İngilizce televizyon programları seyretme ve İngilizce müzik dinleme ile pozitif korelasyon içerisinde oldukları ortaya çıkmıştır. General self-esteem can be defined as one’s perception of his/her self-worthness. This construct is very important in educational science because it influences students’ selfimage related to their academic success. Metacognitive strategies are mostly investigated in cognitive psychology. They facilitate learning process and can lead to more positive English learning outcomes. Hence, the study is to examine interrelations among these variables in order to provide in-depth patterns of learning English as a second language. It has been conducted on 201 State tertiary level in Aegean region and last-grade college students in Turkey in 2016 as the English mastery level of the college students were quite similar to the university ones. Sample consisted of 40.3% males and 59.7% females, who were 16 to 25 years old. This study is a quantitative one, mostly based on the correlational analysis. There were three main instruments: ‘’Rosenberg’s self-esteem scale’’ (RSES), ‘’Metacognitive strategies scale’’ (MCSS), and ‘’A list of factors that impact English learning outcomes’’. The results showed positive correlation between general self-esteem, metacognitive skills and some other factors that can influence English learning outcomes. General self-esteem is in a positive and statistically significant correlation with students’ usage of metacognitive strategies. General self-esteem is in positive correlations with collaborated learning, communication with native English speakers, and with watching English TV channels and listening to English music. The capacity for self-motivation during learning acitivities correlates negatively with teacher’s educational skills, however, achieving learning goals correlates positively with watching English TV programs and listening to English music. In addition, there were no statistically significant gender differences in the mentioned variables. EFL, ESL, general gelf-esteem, metacognitive strategies. Brown, J. D. & Marshall, M. A. (2006). The three faces of self-esteem. In M. Kernis (Ed. ), Self-esteem: Issues and answers (pp. 4-9). New York: Psychology Press. Lawson, J. S., Marshall, W. L., & McGrath, P. (1979). The Social Self-Esteem Inventory. Educational and Psychological Measurement, 39, 803–811. Faraday, S., Overton, C., & Cooper, S. (2011). Effective teaching and learning in vocational education. London, UK: LSN. Goos, M. & Galbraith, P. L. (1996). Do it this way! Metacognitive strategies in collaborative mathematical problem solving. Educational Studies in Mathematics, 30, 229-260. Hein, V. & Caine, A. (2014). Relationships between perceived teacher's autonomy supoort, effort an physical self-esteem. Kinesiology, 46, 218-226. Javanmard, A., Hoshmandja, M., & Ahmadzade, L. (2013). Investigating the relationship between self-Efficacy, cognitive and metacognitive strategies, and academic self-handicapping with academic achievement in male high school students in the tribes of Fars Province. J. Life Sci. Biomed., 3, 27-34. Khezrlou, S. (2012). The relationship between cognitive and metacognitive strategies, age, and level of education. The Reading Matrix, 12, 50-61. Liu, W. C. & Wang, J. C. (2005). Academic self-concept: A cross-sectional study of grade and gender differences in a Singapore secondary school. Asia Pacific Education Review, 6, 20-27. Luhtanen, R. & Crocker, J. (1992). A collective self-esteem scale: Self-evaluation of one's social identity. Pers Soc Psychol Bull, 18, 302-318. MacIntyre, P. D., Dornyei, Z., Clement, R., & Noels, K. (1998). Conceptualizing willingness to communicate in a L2: A situational model of L2 confidence and affiliation. Modern Language Journal, 82, 545-562. Marsh, H. W., Richards, G. E., Johnson, S., Roche, L., & Tremayne, P. (1994). Physical self-description questionnaire: Psychometric properties and a multitrait-multimethod analysis of relations to existing instruments. Journal of Sport and Exercise Psychology, 16, 270-305. O’Malley, J. M. & Chamot, A. U. (1990). Learning strategies in second language acquisition. New York: Cambridge University Press. Pintrich, P. R. & De Groot, E. (1990). Motivational and self-regulation learning components of classroom academic performance. Journal of Educational Psychology, 82, 33-50. Pintrich, P. R. i Schunk, D. H. (2002). Motivation in education: Theory, research and applications (2nd edition). Columbus, OH: Merill-Prentice Hall. Pullmann, H. & Allik, J. (2008). Relations of academic and general self-esteem to school achievement. Personality and Individual Differences, 45, 559-564. Ryan, R. & Deci, E. L. (2000). Intrinsic and extrinsic motivations: Classic definitions and new directions". Contemporary Educational Psychology, 25, 54–67. Smith, E. R. & Mackie, D. M. (2007). Social Psychology (3rd ed.). Hove: Psychology Press. Tabassum, F. & Ali, M. (2012). Professional self-esteem of secondary school teachers. Asian Social Science, 8, 206- 210. Victori, M. & Tragant, E. (2003). Learner strategies: A cross-sectional and longitudinal study of primary and high-school EFL learners. In Mayo, G., Del Pilar, M., & Garcia Lecumberri, M. L. (Eds. ), Age and acquisition of English as a foreign language (pp. 182-209). Clevedon: Multilingual Matters Ltd.
Yin, W. M. & Agnes, C. S. (2001). Knowledge and use of metacognitive strategies. Singapur: National Institute of Education. Zarei, E., Shokrpour, N., Nasiri, E., & Kafipour, R. (2012). Self-esteem and academic success as influenced by reading strategies. English Language Teaching, 5, 17-26. ISNAD AYDOĞAN, Hakan . "Bir Ruh Dilbilim Olgu Çalışması: Genel Benlik Saygısı, Bilişüstü Stratejiler ve İngilizce Öğrenme Çıktıları Üzerine Etkileri". 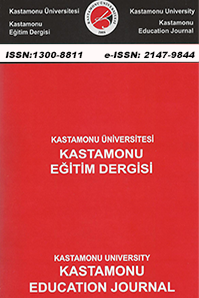 Kastamonu Eğitim Dergisi 25 / 4 (July 2017): 1405-1420.